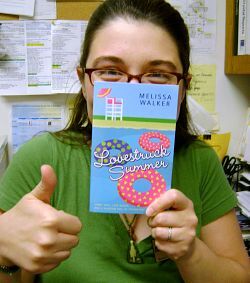 Author Melissa Walker was kind enough to send me an ARC (Advanced Reader Copy) of her soon-to-be-published book Lovestruck Summer and I plowed through it in one day! Quinn (first name Priscilla, but that's too girly-girl, so her middle name is better) loves music. She loves her iPod. She loves the band the Walters. And she loves boys who love music. Her senior year is over and before she goes off to college, she's spending the summer in Austin, Texas, living with her cousin Penny (president of the Tri-Pi sorority and definitely Quinn's opposite), interning at indie music label Amalgam Records, and hunting for the perfect indie-music loving boyfriend (musician or DJ, either one will do). Quinn meets Sebastian, the perfect indie-music, DJ. But then there's Russ, cousin Penny's frat-cowboy neighbor who hangs around an awful lot. Only, Quinn doesn't really care about Russ. Sebastian is perfect for her. . .right? I have to admit that I'm not exactly a girly-girl, so I honestly might not have checked this book out because it does have a more girly cover. But I am SO glad I read it! I read part of it on my lunch break at work and was laughing hysterically every few minutes. This is a great read to get you in the mood for summer. It's smart and funny and has romance that's sweet and not gushy. I will certainly be reading more of Melissa Walker's books!